While Traditional Filipino Martial Arts are mostly known for Filipino Stick Fighting, it is an art the encompasses a variety of other fighting arts. FMA can be traced back to the 1500s and it has produced a number of world-renowned martial arts since then. In this section, we will discuss some of the lists of Filipino martial arts our ancestors practiced throughout the decades. Arnis, Kali, and Eskrima are most popular umbrella terms for the traditional, weapon-based, martial arts of Filipinos. Arnis is a term from the north, Ekrima comes from the central part of the country, and Kali comes from the South. Numerous practitioners believe that Filipino Martial Arts Kali is the older, more inclusive “warrior’s art” than Arnis or Eskrima. In general, the terms refer to the Filipinos’ indigenous weapon fighting systems. Every group and frequently every Grand Master have a distinctive style or technique, but all of them share the same fighting principles and styles. The inherent need for self-preservation was the foundation of these systems. And all through the ages, local conflicts and foreign invaders imposed new combat dynamics in the islands, now comprising the Philippines. 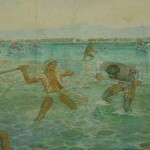 Filipinos developed and enhanced these combat skills mainly because of their ever-evolving circumstances. Oftentimes, they learned out of the need to allocate, prioritize, and utilize common, day-to-day resources in combative scenarios. The categories of weapons include impact, edged, projectile, and flexible. And there are a variety of weapons taught in FMA, but the system mainly focuses on the knife and stick fighting. The training in empty hand includes grappling and striking. 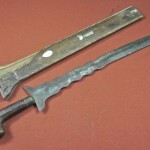 Traditionally, Kali students begin training with weapons and only proceed to empty-hands training when the knife and stick techniques have been mastered. This contrasts with many other popular Asian martial arts. The reason there may be to condition the trainee to fight against armed attackers because armed fights are very common in the country. Also, an armed individual obviously has more advantages that the untrained or unarmed assailants. The concept here is that empty-hand movements are learned naturally through the same exercises or drills as the weapon styles, making muscle memory a crucial aspect of training. Most martial arts techniques use one set of methods for the empty hands, stick, and knife, which is a principle usually called as motion grouping. Because the weapon is considered an extension of the practitioner’s body, the same footwork and angles are applied either with or with no weapon. The main reason for this has something to do with history. Tribal warriors were constantly engaged in battles using weapons and depended on empty-hand combat only after losing the weapons. So even when a student only uses one weapon, the other hand is used to disarm, control, or tap an attacker’s weapon, as well as to help in joint locking, blocking, and manipulation, or other simultaneous moves like destroying the limb using the live hand. The different forms of Traditional Filipino Martial Arts. A distinctive feature of FMA is the use of geometry. In defenses, strikes, and movement, angles and lines are imperative. Also, using the hands or both hands and feet independently to perform two different techniques simultaneously is an advanced skill that is practiced. Filipino styles and techniques usually classify attacks not just by their weapon or delivery, but by its energy direction, such as in the different angles of attack. Students master how to handle the attack’s energy, and then use that knowledge to the different variations that come with various lengths and weapons. Filipino martial arts place a significant emphasis on body positioning, mobility, and footwork. The same concepts (deflections, passes, traps, angles of attack, etc.) are used in similar cases at various ranges, thus learning and understanding ranges are very crucial. Filipinos make a wide-ranging use of geometric shapes and applying them to many dangerous situations. 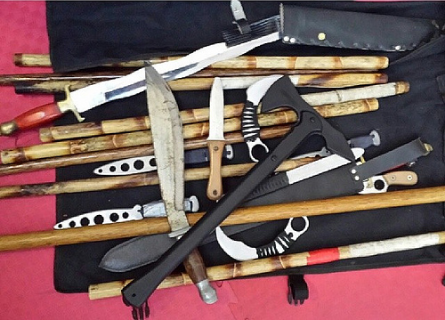 Those are just some of the traditional Filipino Martial Arts schools that you can find in the Philippines. The most popular among these has always been Eskrima – the Filipino art of Stick Fighting. It is best to choose a school that would suit your needs. In my case, I’ve chosen the style of Balintawak Arnis because of it’s combative and defensive nature.